Sticking with our ballpark theme this week, C.O. 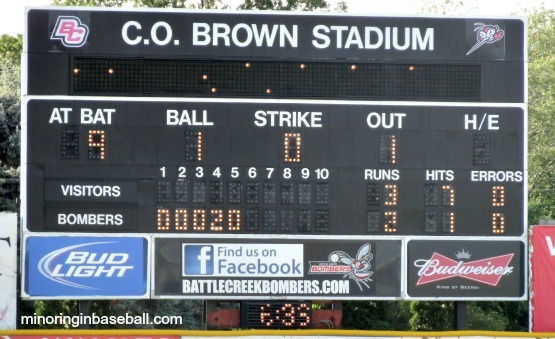 Brown Stadium, home to the Battle Creek Bombers of the Northwoods League, has its own renovations in store for the 2014 season. As the scoreboard at C.O. Brown was struck by lightning last season, a new and improved one will take its place, and the outfield fences tended to. The centerfield fence will be moved and lowered, and should give the outfielders a chance to rob some home runs, but also make the ballpark a little more hitter friendly. All the fencing in the infield, will be replaced and upgraded, also, including the field and grandstand areas. There will be new poles, lamps, and lights in the outfield and infield that will improve the overall play of night games. The Bombers will also be re-vamping the parking lot on the third base side, increasing the flow of traffic before and after games. As of now, there is only on main entrance into the whole Bailey Park complex. The organization will also be re-painting areas of the ballpark, including the restrooms and visitor’s clubhouse. 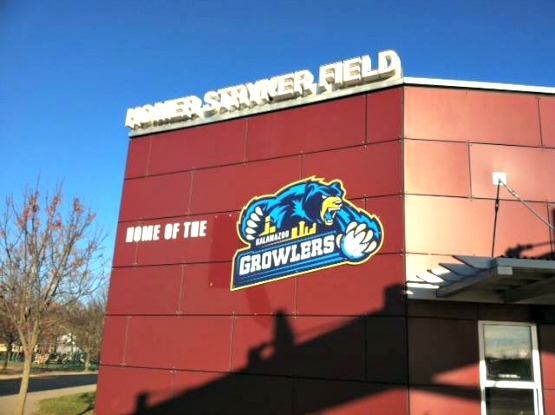 The Bombers expect to have all of the renovation completed by the time their opening day rolls around on May 29th, when they host the new Kalamazoo Growlers. The upgrades might not seem as grand as the ones in Lansing and Grand Rapids, but they will make Bombers’ games a better experience for the fans. On Friday Kalamazoo Baseball introduced their new team name and logo. 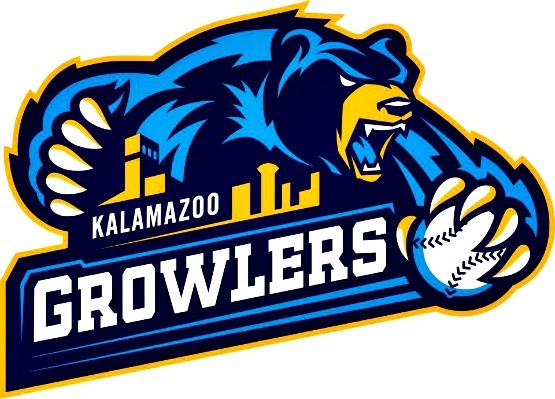 The new team entering the Northwoods League will be dubbed the Kalamazoo Growlers. The team will play in 2014 at Homer Stryker Field, who last hosted the Kalamazoo Kings of the Frontier League. The manager for the new team will be Joe Carbone, who is the second most winning coach in the Mid American Conference history at Ohio University. He is a two-time MAC Coach of the Year, and was the Midwest Region Coach of the Year in 1997. 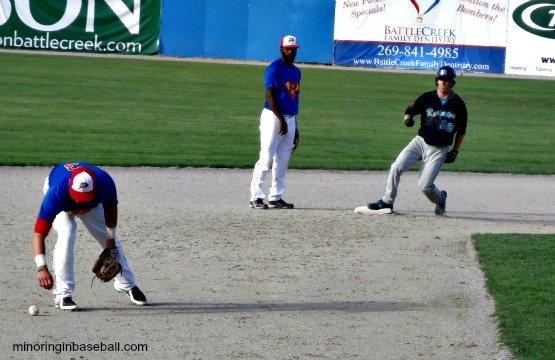 The Growlers have also two players from Western Michigan University lined up for next season, also, in catcher Brent Sunde and outfielder Jared Kujawa. Although I spent my childhood watching minor league hockey in Kalamazoo with the K-Wings, I look forward to seeing the Growlers play ball. Kalamazoo also has a great history of baseball, as the first College World Series was played there, also. They’ll have a good rivalry with the Battle Creek Bombers just to the east. I still think that if these two communities would have worked together, there could still be an affiliated minor league program located just between the two cities. 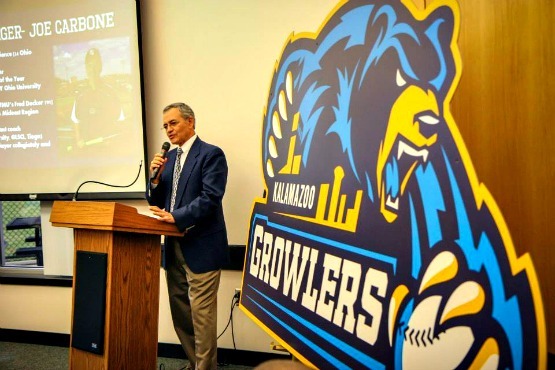 Kalamazoo, Michigan will finally be getting a new baseball team for the first time since 2011. The team will be competing in the Northwoods League, which is a summer college wooden bat league. This is the same league that the neighboring Battle Creek Bombers play in. 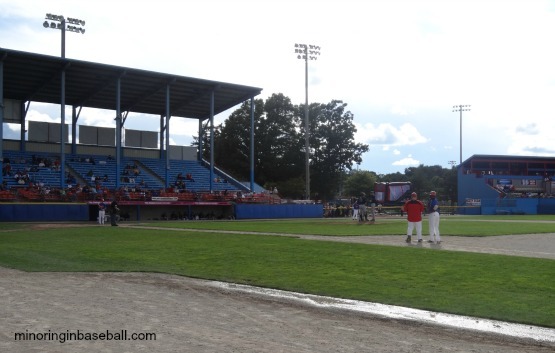 Home games will be played at Homer Stryker Field, same as the prior tenant the Kalamazoo Kings of the Frontier League (same as the Traverse City Beach Bums). The Kings suspended operations after the 2011 season, and never were able to get the team running again. Fans in the Kalamazoo area have submitted their ideas for a team name, and the finalists are: Cabbies, Clutch, Growlers, Kangaroos (K-Roos), and Krakens. My pick would be the Kalamazoo Kangaroos, but the franchise will announce the winner at an Opening Night Event on November 15th. This free event will feature the un-veiling of the new team name and logo, along with the manager and coaches. 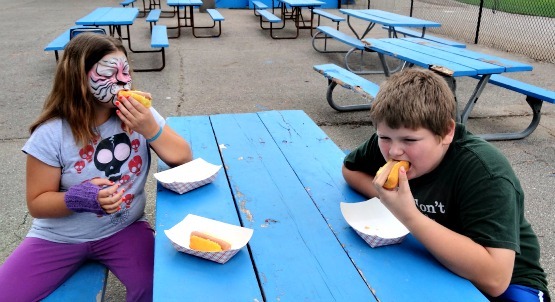 Fans will also be able to receive free ballpark food and nonalcoholic beverages, participate in a free raffle, and their will be free kids games as well. Fans will also be able to interact with the team owners and front office staff. I’ll definitely be following this team, and hope to be able to attend a game next season. I’m pretty familiar the the city also, as I grew up on minor league hockey watching the Kalamazoo Wings of the old International Hockey League when I lived in that area. C.O. 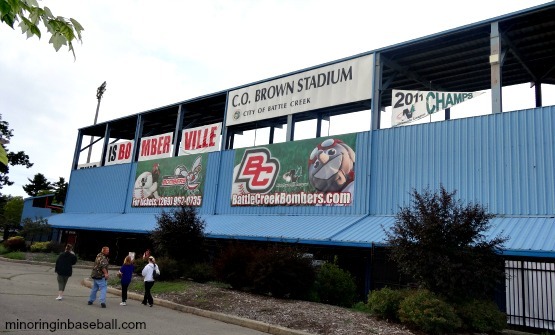 Brown Stadium–Battle Creek, MI: It seems to always rain when we visit Battle Creek, and this trip was no execption. We were lucky enough, though, that it stopped in time for us to enjoy ourselves at the ballpark. Here at C.O. Brown Stadium, where my love for Minor League Baseball began, has now seen four generations of my family enjoy baseball here. Because trips to BC usually revolve around family, however, not necessarily baseball, it was good to enjoy the game with loved ones. 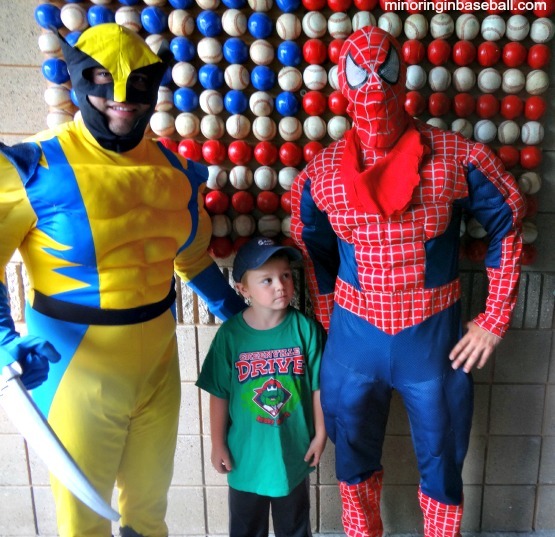 It was also super hero night at the Bombers game, so even though Brian was a bit tired and grumpy from the long trip, he perked up when he saw the likes of Wolverine, Spider Man, and Batman. 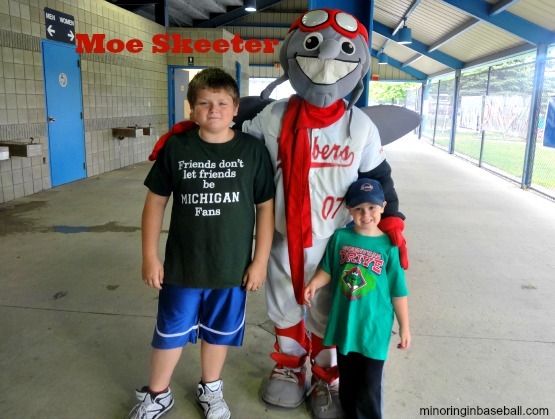 The boys also met the BC mascot, Moe Skeeter! 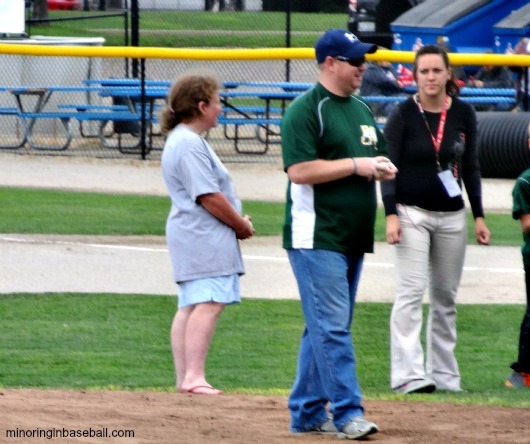 My dad also set me up to throw out the first pitch, despite the fact my birthday was last week. I shot a perfect strike, and was even complimented by the Bombers’ catcher. Brian really wasn’t happy with me that I was on the field without him, but he got his turn later in the game. 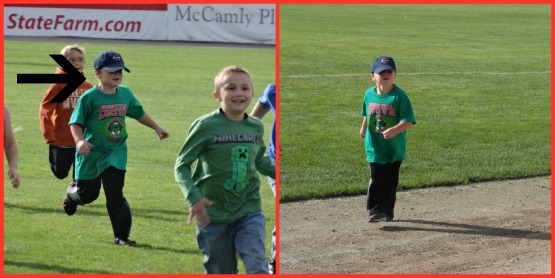 At one point the kids chased the super heroes through the outfield, and he also competed in a race where he had to run with flippers, a scuba mask, and floatie. He did better than the other kids he was racing, but wasn’t happy about falling while running in the flippers. Anyway, we had a super fun time on super hero night, and it’s always good to visit family. 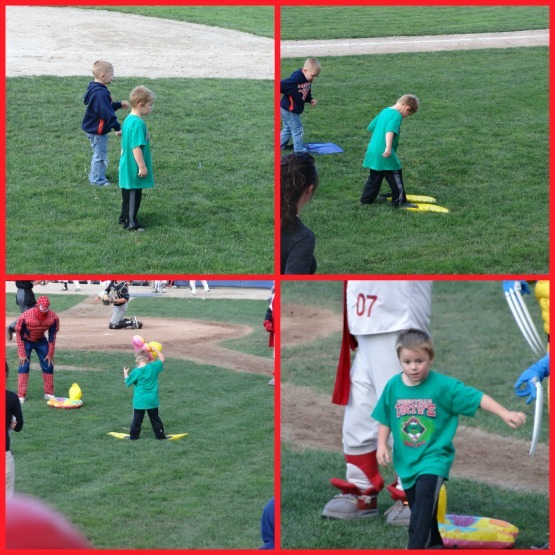 Throwing out the first pitch…strike! Ok, the game itself pitted the hometown Bombers against the Rochester Honkers in Northwoods League action. 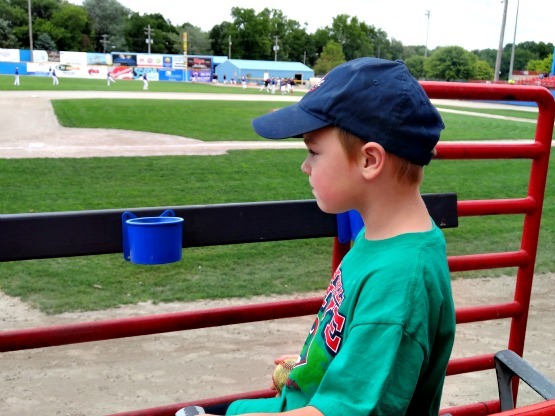 The Northwoods League is a summer college wooden bat league. Some of the best college players in the country hone their skills here. 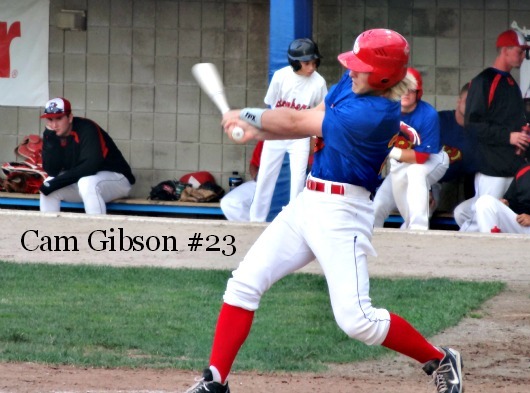 Playing for the Bombers is Cam Gibson, son of Detroit Tigers legend Kirk Gibson. During the school year, Gibson suits up for the Michigan State Spartans. 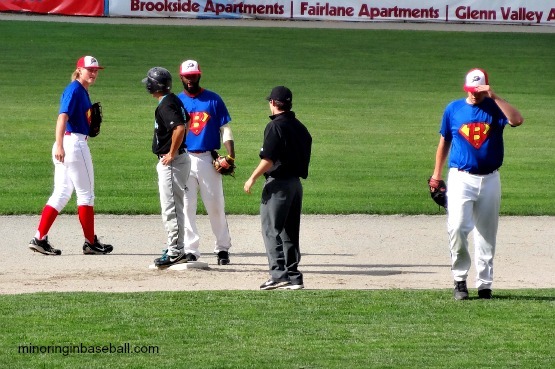 Due to super hero night, the Bobers were wearing special jerseys to look like Superman. We had some free baseball, too, as the game went into extra innings. The Bombers only had six hits in the game, but the Honkers’ pitching staff had trouble finding the plate, and walked in some runs. The Bombers scored in the bottom of the ninth to tie the game, and came through with a run in the 12th for the win. On the hill, Todd Eaton earned the victory, pitching four innings, giving up one hit and striking out four. 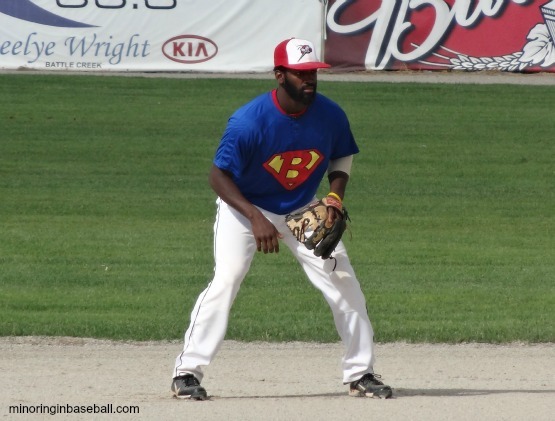 Offensively, the Bombers didn’t have much going, but Rouric Bridgewater (Arizona State) was 1-3 with a RBI and run scored. Final: Bombers 6, Honkers 5 (12 innings). 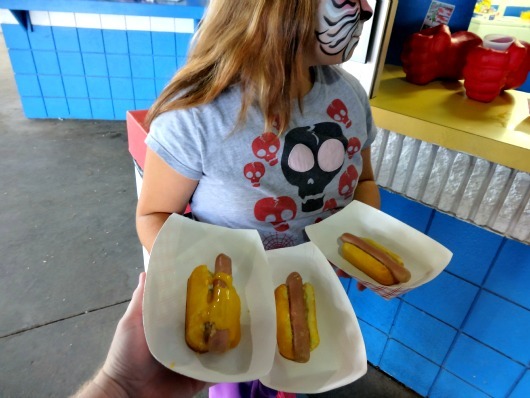 If you find yourself in Battle Creek with some time to spare, the Binder Park Zoo is a nice place to visit, especially for the kids. 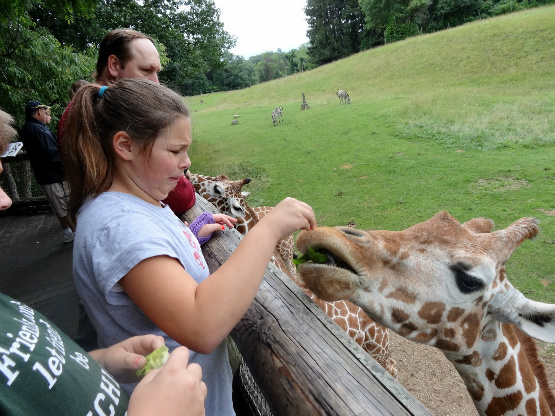 The one thing they really got a kick out of is feeding the giraffes! The looks on their faces were priceless! Lots of other animals to see there, too, but the Africa exhibit is probably the best. Before hitting the books this fall, a group of young baseball players from all around the county banded together to give the Battle Creek Bombers their best season in history, winning the Collegiate World Series and Northwoods League Championship. After a rough 2010 campaign, the Bombers added a new GM, new manager, new pitching coach, new front office staff, and even adopted a new logo for 2011. The formula seemed to pay off….especially new manager Donnie Scott, who known as a ‘players coach’. He brought Major League playing experience and Minor League coaching experience to his post in Battle Creek. The Bombers finished 43-26 for the best season in franchise history, and after going 20-50 in 2010, their success this season is the biggest turn around in Northwoods League history. Their 27 win improvement shatters the record of 19 set by the Kenosha Kroakers back in 1995. The Bombers defeated the Green Bay Bullfrogs to win the Southern Division Pennant, and then beat the Northern Division’s Mankato Moondogs for the title. Scott credits his players, though, who had some great individual efforts this season as well. Bryce Redeker broke the home run record with 11, Jordan Dean set the record for hits, doubles, and at-bats, Danny Rockett knocked in a franchise record 53 RBI’s, to name a few. The Battle Creek roster included players from Central Michigan, Taylor University, Evansville University, Northern Illinois, Western Illinois, Texas San-Antonio, and Miami of Ohio. Winning also helps at the gate, and Battle Creek fans helped attendance reach a record high at 1,176 per game in 2001, which is a 49% from 2010. Unfortunately, we couldn’t be part of there numbers, as we didn’t get a chance to get down to BC this summer. We were rained out in our attept at a Bombers game last season, and will try to make it down in 2012. Battle Creek is a great baseball town, and I’m really glad to see the team earning some success and attendance numbers up. 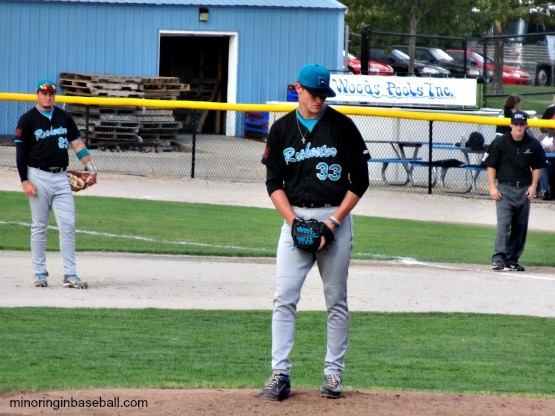 Also helping the Bombers this season was right-handed pitcher Nolan Sandburn from the University of Arnaksas. 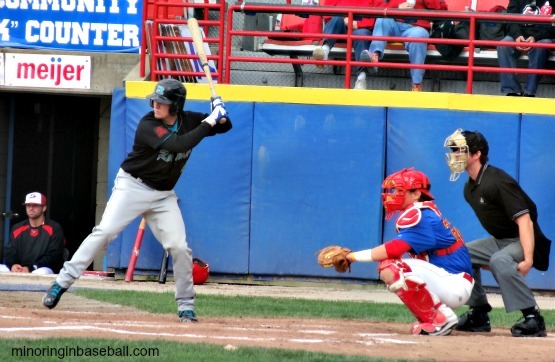 Sandburg is ranked as the #1 prospect in the Northwoods League by both Baseball America and Perfect Game. A sophomore, he appeared in six games for Battle Creek, striking out 24 and walking nine. He was 0-1 with a 2.33 ERA. Sandburn’s fastball has been clocked at 98 mph. Also appearing on Baseball America’s prospect list at #18 is Bombers pitcher Ben Ballentine, who is a junior at the University of Michigan.